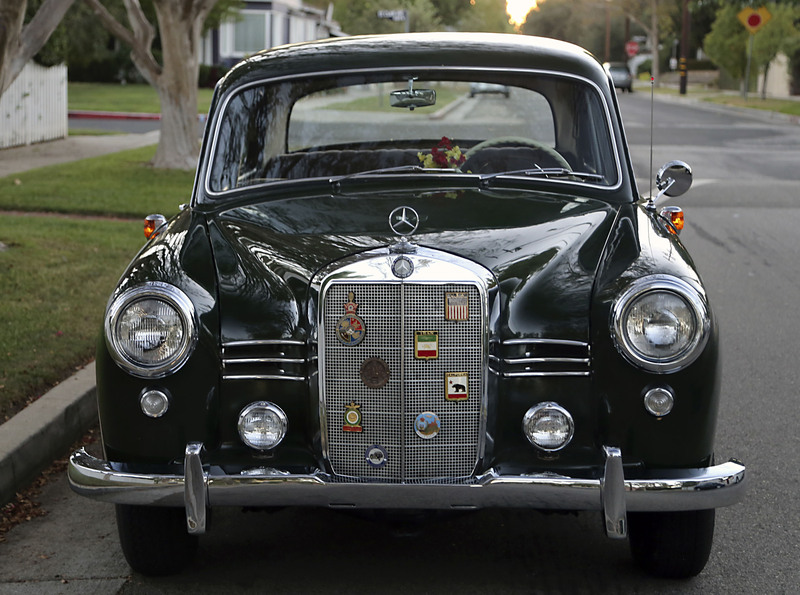 I was born during the 1950s in Iran, and every one or two years a new Mercedes-Benz model was coming into our household. 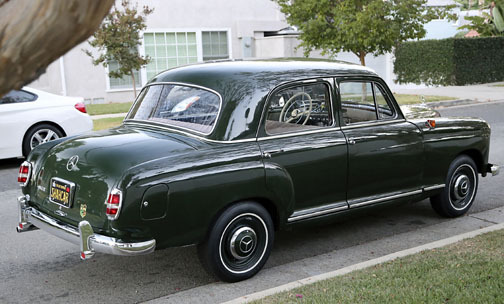 Among them, my father was attached to one of the Ponton Type 180 sedans, which was "pistachio green." 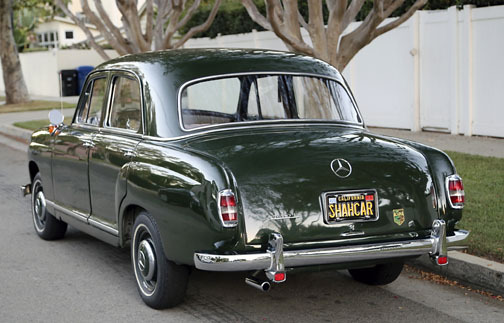 The official color may have been DB 213 Mother of Pearl Green – Ed. He maintained it for many years. Regretfully, one day I found out that he sold it to an Air Force pilot. I learned about mechanics with the Ponton, learned how to drive, and got my license with a Ponton, and many good childhood travel memories were with those cars. With the change of political atmosphere, I left that country and settled in the U.S. I am a paper architect and my profession is research and restoration of historical buildings on paper based on documented evidence. For the past 34 years, I have lived in Los Angeles. However, I always wanted one of those Pontons. While viewing mbzponton.org I confronted the car, and immediately knew it was the same one. Photo 1. Front ¾ view. 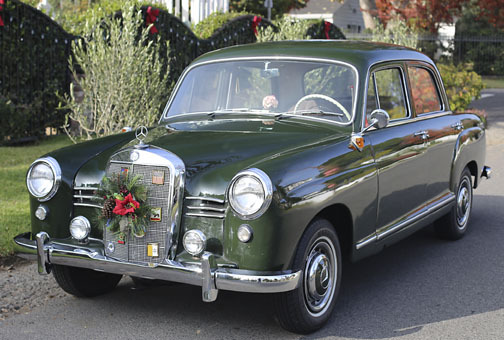 Unmistakable, "early" 4-cylinder Ponton body style (pre mid-1959 facelift). Despite being illiterate about diesel engines, I decided to purchase it (on eBay). 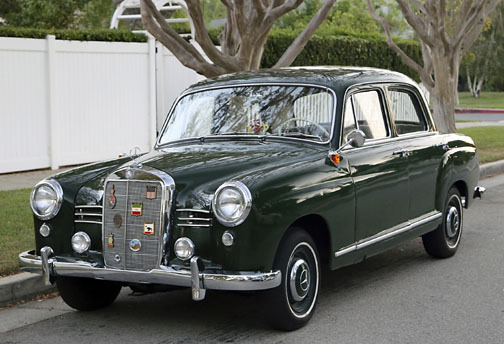 The owner, for some unknown reason, decided to sell it to another bidder – even for a lower price!? A couple of days later, I left town for a software training seminar. During my stay at the hotel, I checked eBay again for a Ponton, and could not believe my eyes – the same car was on eBay again! I paid a lot more, but won the bid and finally got what I wanted. The first owner was Dutch and purchased it from Germany. Then he moved to Canada. 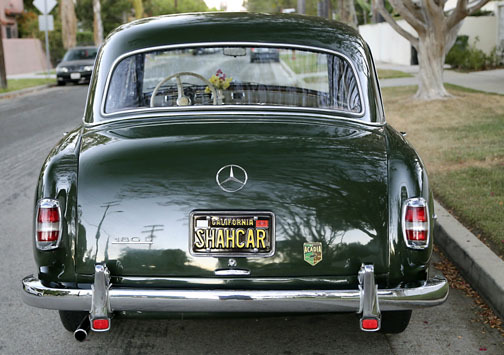 The second owner purchased and transferred it to Los Angeles, and I am the third owner. 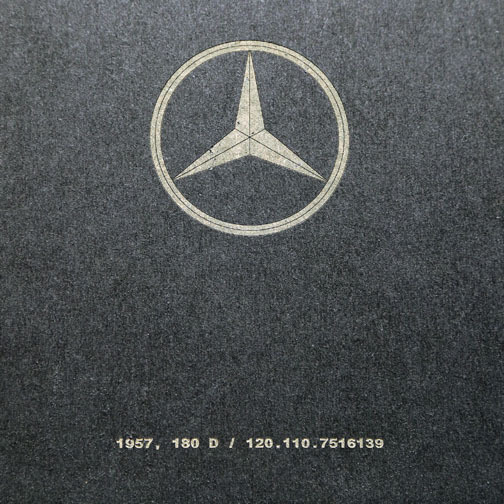 With attention to original detail, every single inch of car was checked, and if necessary repaired according to the Mercedes-Benz repair manuals. Even the altered, English-sized nuts and bolts that were substituted during the past 60 years for convenience were replaced with the original metric sizes. All major part's I.D. numbers match the factory data card. The color is how it was found – just cleaned. I do not know the exact color code. 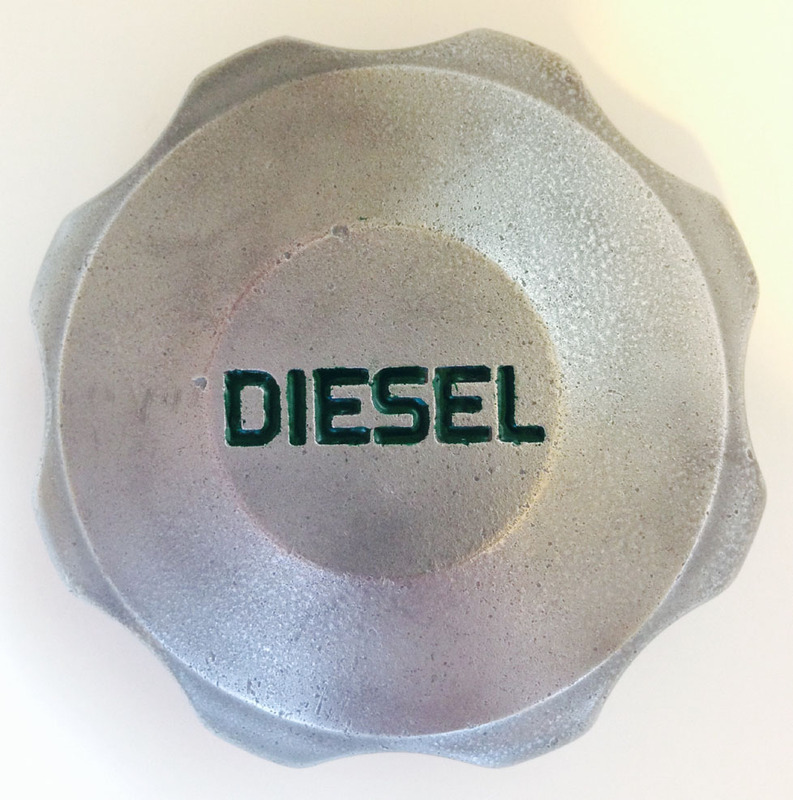 The official color may be DB 221 Dark Green – Ed. 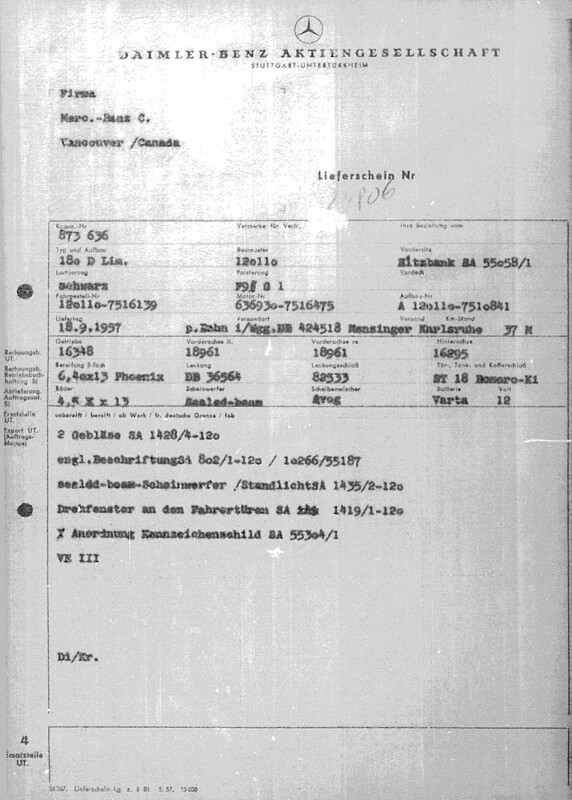 The data card (see Photo 26) says "schwarz" (black). However; during the restoration, we checked every inch of the car – inside and out – even in the engine compartment, inside the doors, small cavities, etc. and they were all same green with no trace of black anywhere! Tried to find the original Dutch owner in Canada, but he passed away many years ago, and all of the Canadian documents and inspection documents indicate the green color. This is still a mystery to me. The drive shaft, engine freeze plugs, injection pump, brakes and related parts, battery, electrical, generator, starting system, and muffler were repaired, refurbished, or replaced. All floor panels and doors were insulated with a foil and foam sheet. The bumpers and trim pieces were re-chromed. A new steering wheel was installed. The radio, window seals and channels, windshield seals, carpets, and front dashboard were all refurbished. 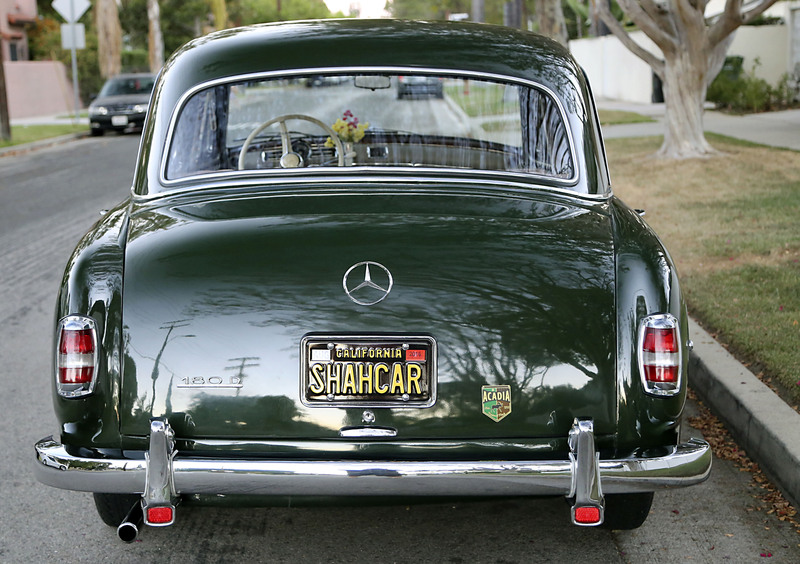 My wife and I decided to name it “Shāhcar” since in my heritage and Persian language it means “masterpiece” and I believe these cars are worthy of the moniker. 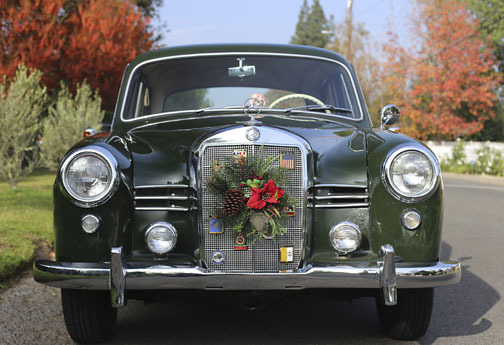 Many Thanks to Jeff Miller for the mbzponton.org website, and those members with the productive knowledge and guidance who make it possible for the rest of the Pontoneers to maintain these great motor vehicles. Photo 2. Front view. 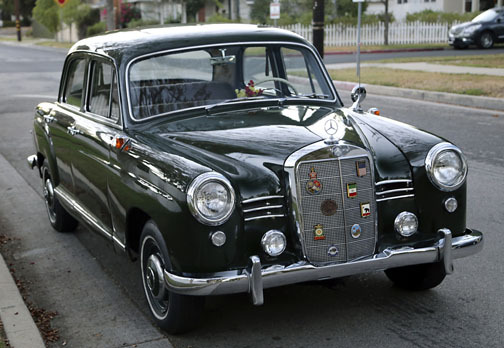 Note the International Ponton Owners Group (IPOG) grille badge – bottom left. Photo 3. Fog lights enhance the distinguished appearance. Photo 4. Narrow white wall tires (P185/80R13) maintain the overall conservative impression. Photo 5. 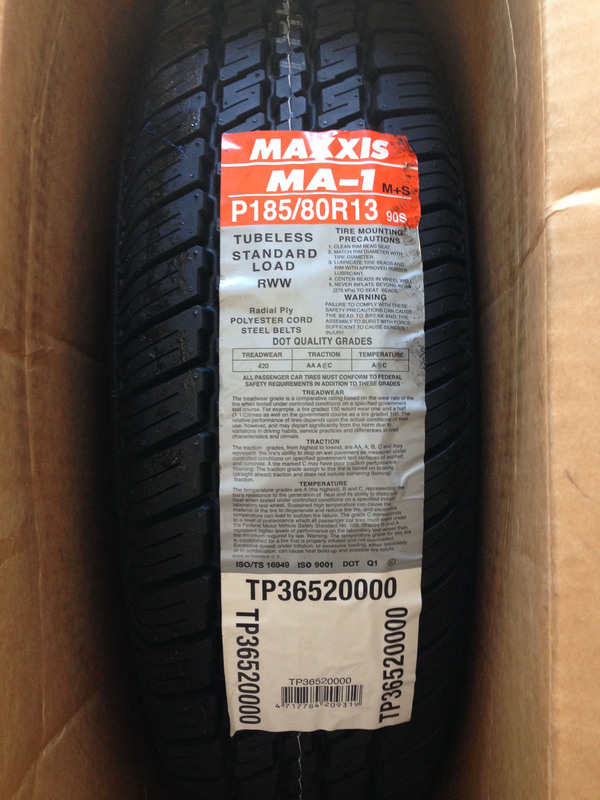 One of the the new tires ($100.28 each / shipping included). Photo 6. 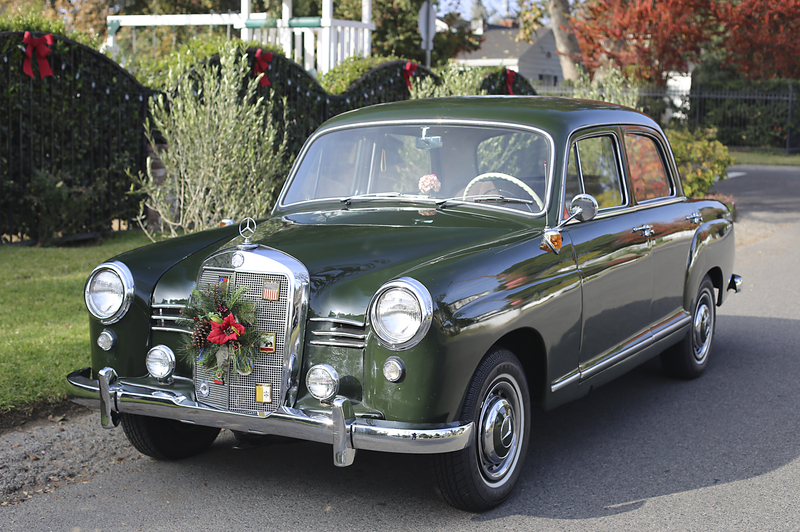 Beautiful, original dark green exterior. Wait! The Factory data card says "schwarz" (black)? Read text elsewhere on this page. Photo 7. Replaced any English-sized nuts and bolts that had been used over the years with original metric hardware. Photo 8. New ivory steering wheel, and bench seating for two (or three) up front! Photo 9. Notice restored dash top and VDO volt meter. 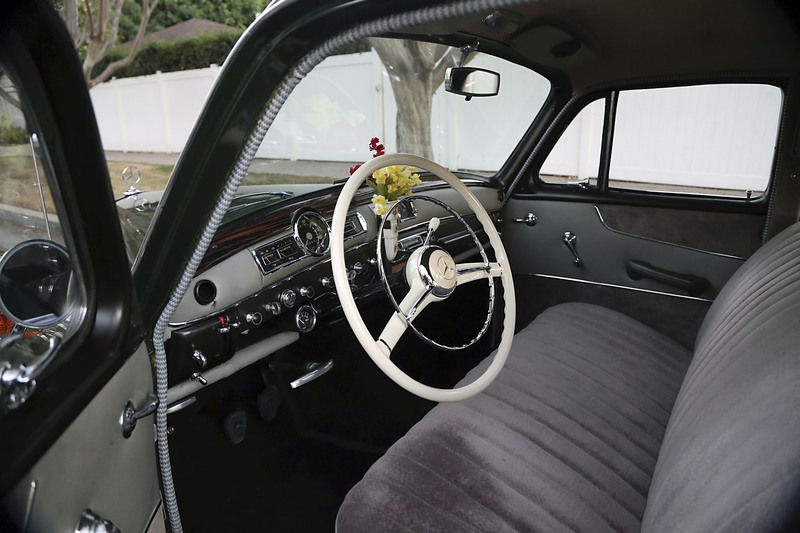 The dash top molding was restored by replacing the round scarf above the speedometer, and resurfacing with Madagascar Ebony. Finally, eight layers of marine lacquer was applied to withstand the bright, sunny California climate. Photo 10. 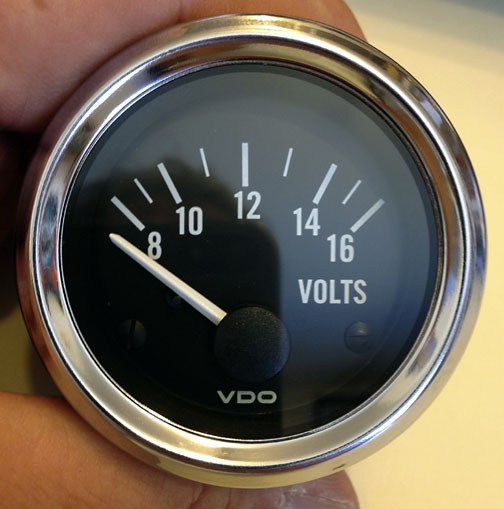 Detail of VDO volt meter. 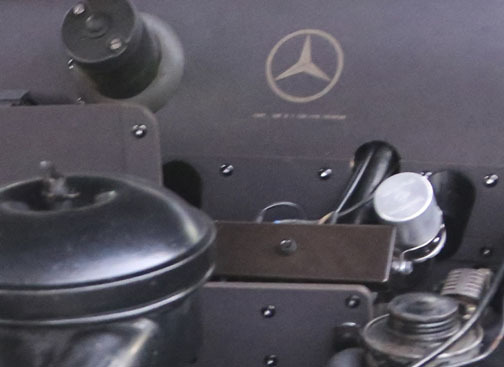 A VDO voltmeter with the matching chrome bezel to the binnacle was fitted into the empty map box area underneath the dash in order to be able to check the battery voltage prior to starting the engine, and being visible enough to monitor the generator and regulator voltage while driving. 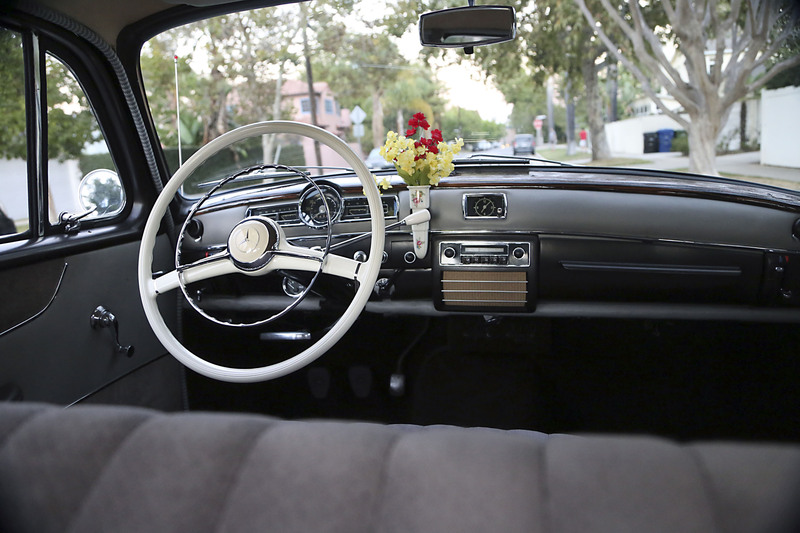 The voltmeter was tailored by North Hollywood Speedometer to match the rest of the dials. They also made an extra speedometer cable, serviced and calibrated the speedometer. Very happy with their service. Photo 11. Interior was restored and looks quite period-authentic. Photo 12. 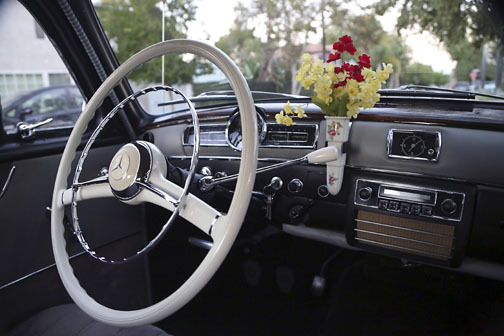 Beautiful ivory steering wheel (new), and original era vacuum tube radio. Elegant bud vase adds a touch of class! Photo 13. Becker Europa vacuum tube radio. 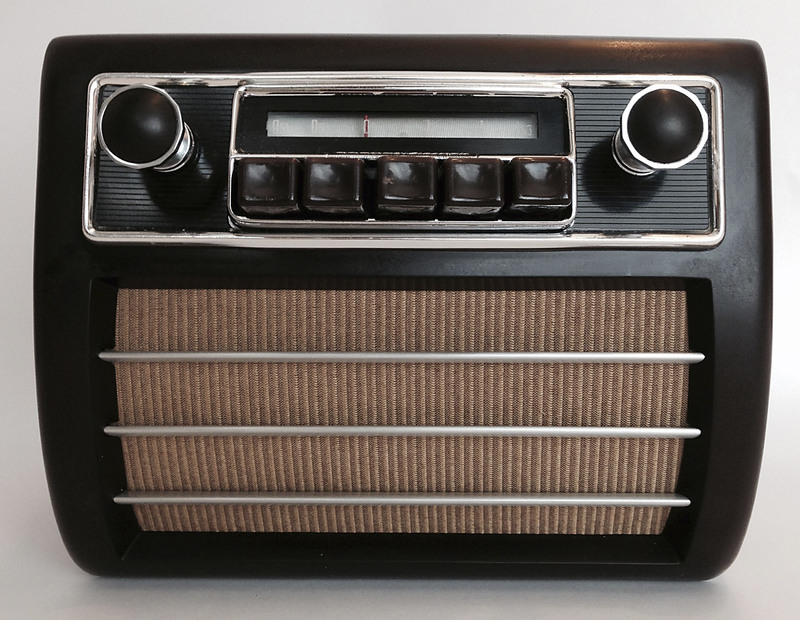 The radio was refurbished by replacing the speaker board made from 3 mm (1/8”) Masonite. 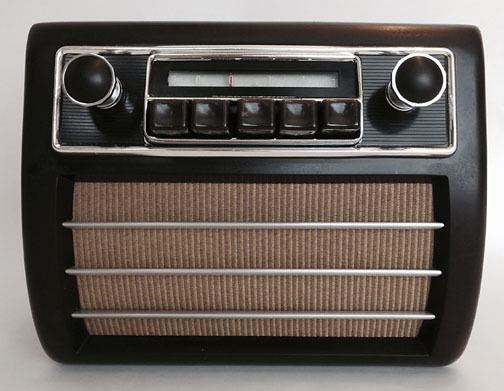 The detreated speaker cloth, rusty horizontal metal moldings were replaced, and the radio dial and black background sheet behind the volume control with the horizontal lines were replicated. The two non-matching knobs were replaced with the correct, original ones. Photo 14. 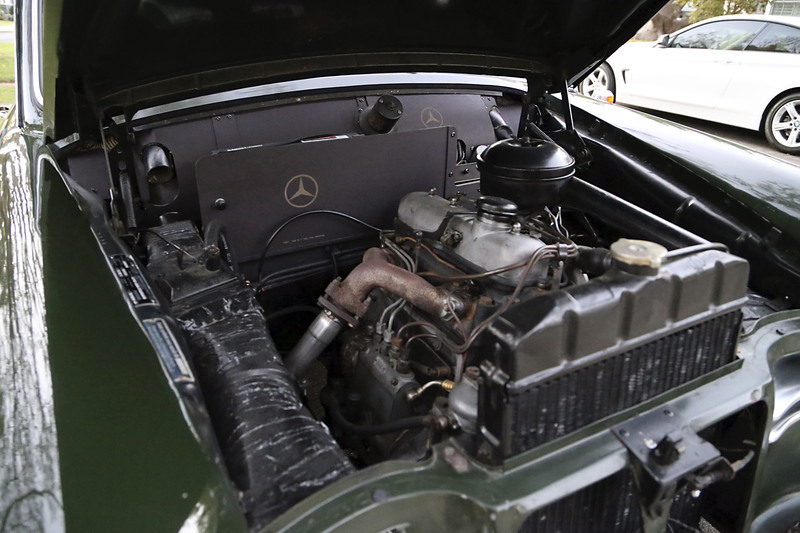 Under the hood – The undaunted 1.8 liter diesel engine (OM 636.930). Photo 15. Detail of cardboard dividers. Photo 16. Detail of cardboard divider. Photo 17. Home-made (with AutoCad) cardboard dividers at original 3 mm thickness. All panels were fabricated from 3 mm (1/8") thick dense black cardboard panels like the original ones. 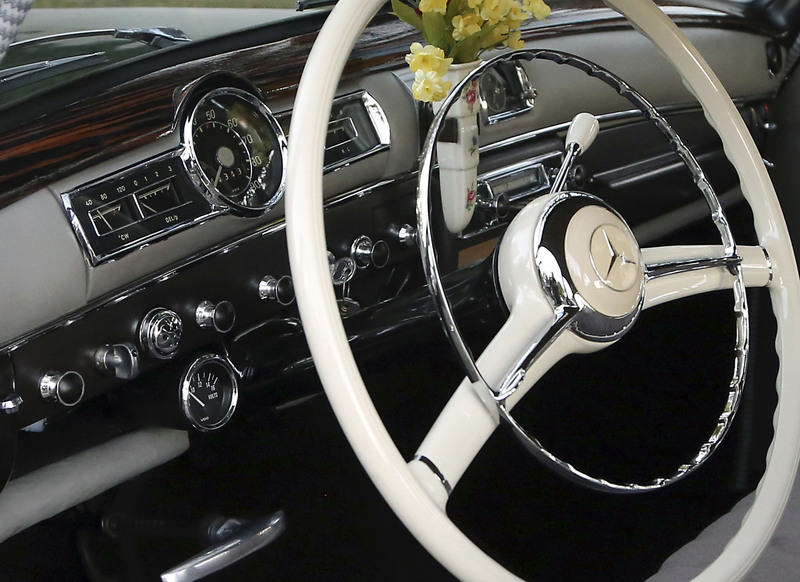 Two panels were made for inside the engine compartment; one for above the engine wall (to reduce sound, and dust penetration into the instrument cluster) and glove box, and the other to cover the monstrous diesel battery. This panel extend to the end of the fuse box. Another panel was made for inside the car right underneath the dashboard to the width of the car, which covers the crude metal and the wiring. Inside the glove box, the same dense black cardboard was used, and covered with a black suede-like velvet material. 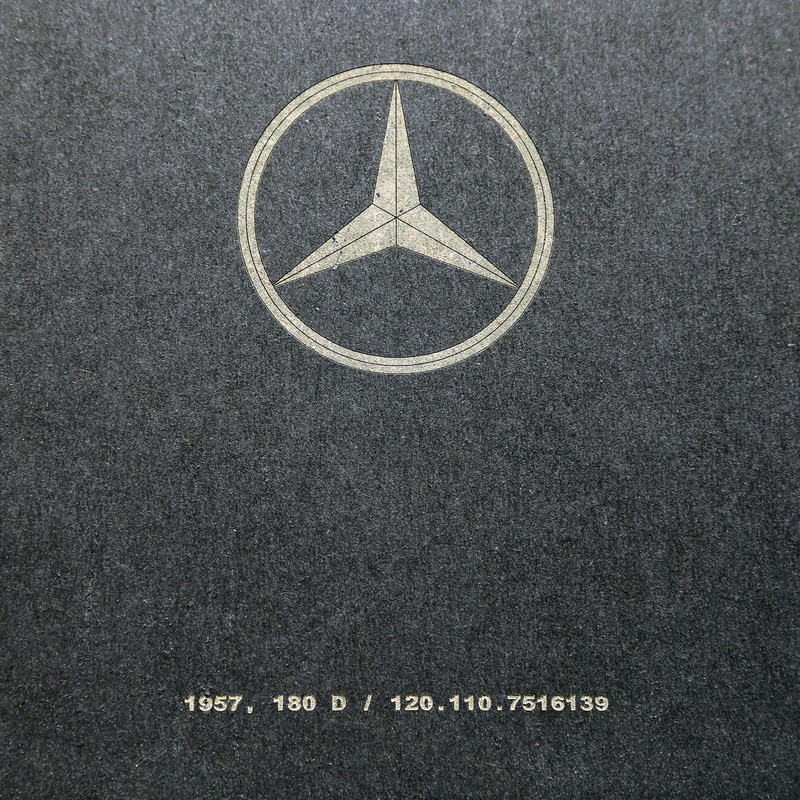 Also, gray vinyl floor mats and door bottom sills were purchased from Germany. Upon arrival, I was uncomfortable with the look. Then ordered a relatively expensive ($65/yard) coffee-colored, German-made, wool carpet, which was specially made to match the color of the Bakelite trim. They were tailored and installed so the interior colors were coordinated and complemented each other. 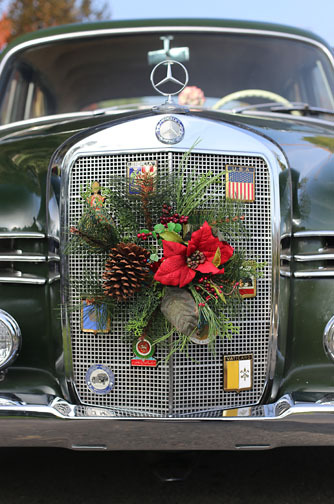 For the trunk (Photo 18), a black carpet was selected in order to match the black spare tire. When the trunk is opened, you only view black and green. All vinyl flooring material was vacuum-packed and stored for future use. In case of need, they can be put into place in a few minutes. Photo 18. 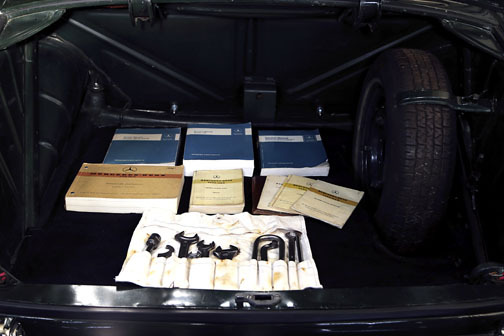 Clean trunk with original toolkit, and printed Factory manuals, which nicely complete the package. Photo 19. 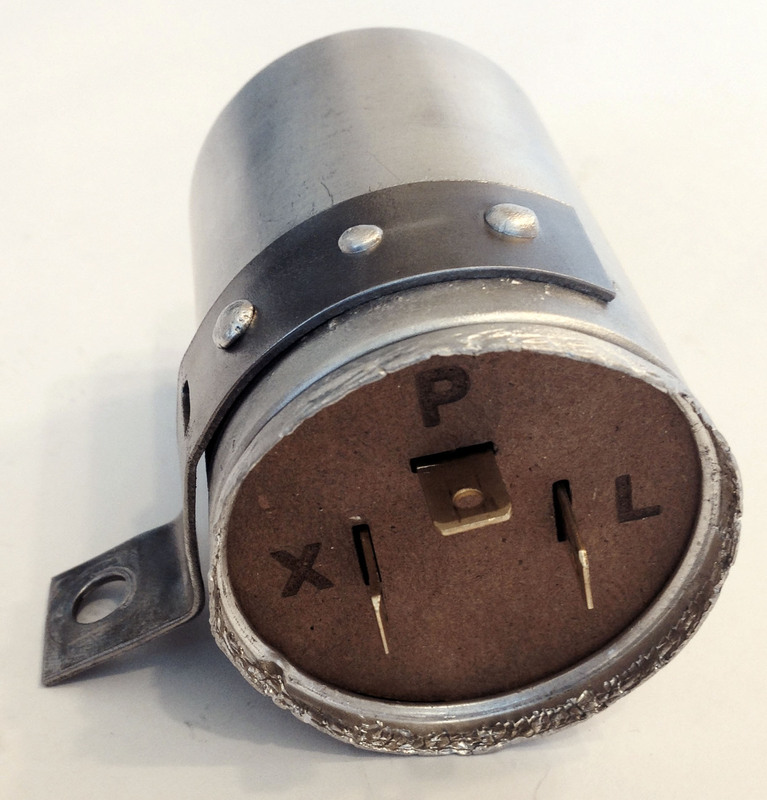 Blinker relay was refurbished. Many years ago, the original signal relay was shorted and nonfunctional, but fortunately it was still on the car. 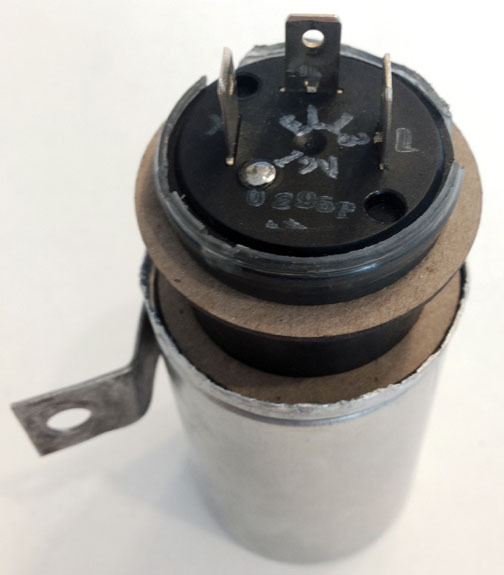 The inside was cleaned, and a part was created for a new three pole relay and was nested into the old shell to maintain the original look. Photo 20. 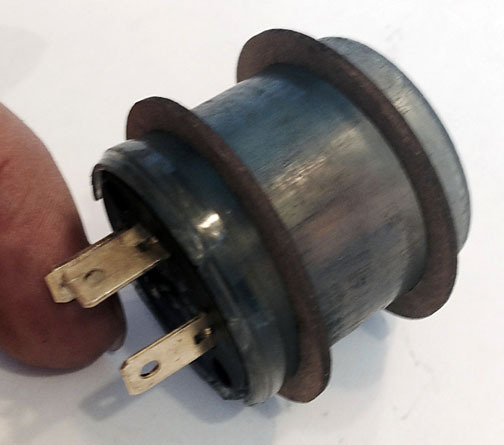 Blinker relay with ingenious spacers. Photo 21. Fits inside the original canister. Photo 22. Blinker relay completed. Photo 23. 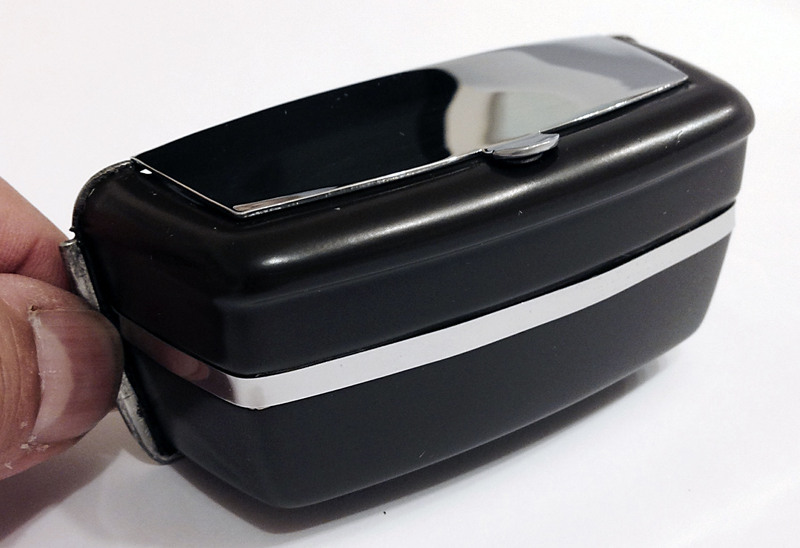 Rear ash tray - closed. 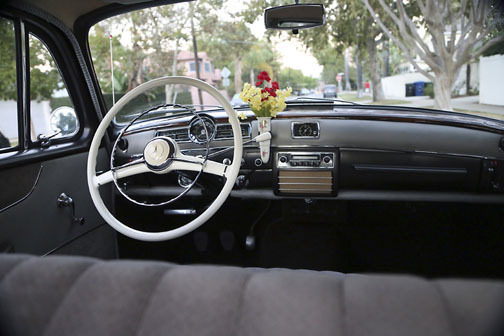 The exterior of rear door ash trays were refinished with the matching color. 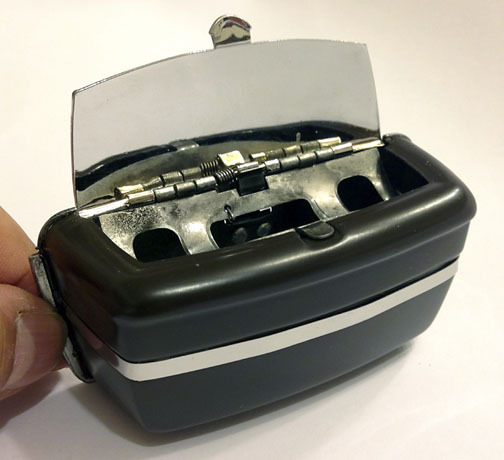 The interior refurbished and the re-chrome lid was reattached with the same 1.2 mm diameter piano wire, which acts as the hinge pin. 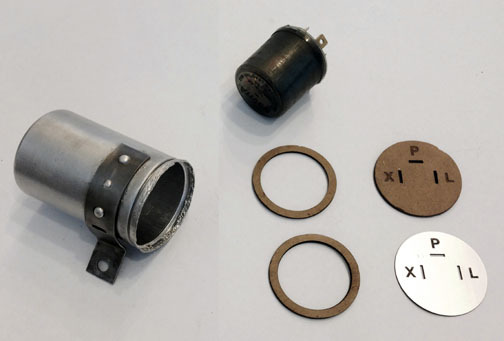 The paint used for rear ashtray was KRYLON code 2205 Light Anodized Bronze. Photo 24. Rear ash tray - open. Photo 25. Helpful reminder so the motorist puts the right fuel in the tank. Photo 26. Data Card (original build specifications) – from Factory microfilm. Photo 27. 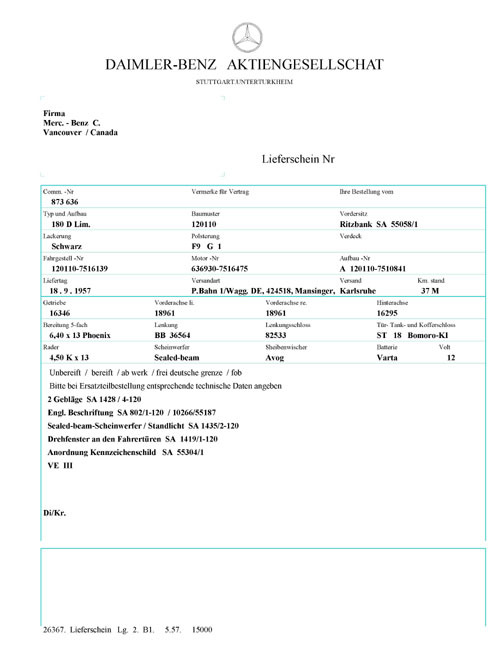 Data Card – restored. Photo 28. Data Card – English translation.